Tomorrow's the last day of my fast–and I'm ready. Yesterday I almost broke down and ate when in the afternoon I hit a mental wall. I was hungry, irritated and restless. I hung in there and kept drinking my juice and tea and gratefully got through. I'm glad I did. My goal is 14 days; almost there. 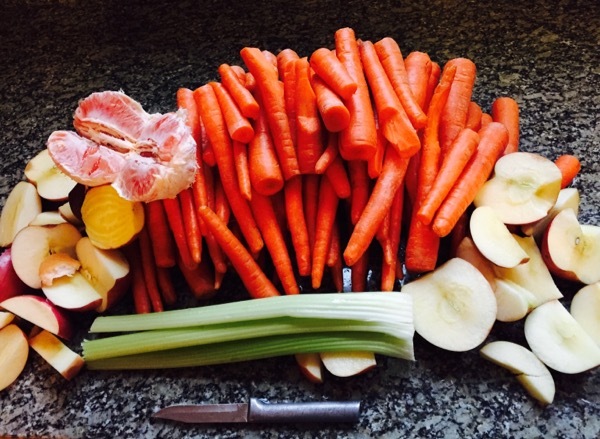 We've got a little carrot (haha), celery, apple, grapefruit, and just 1/2 of a golden beet and red beet. It should be tasty, bright and will nourish my blood, kidneys, liver, cleanse my skin and body. Yay juice! Why am I doing this? Fasting is so extreme! Let me start by saying that I've been fasting for 10 years now so I've evolved to this point. My first fasts were only 3-4 days and I gradually learned to do it better and longer–and reap more benefits from the experience too. Most of my issues are inflammation related and fasting lowers inflammation in the body in a really profound way. It's not just temporary: Longer fasts heal from the inside out. Healing the gut takes place beautifully during a fast, strengthening digestion and improving assimilation of nutrients. The lining of the gut itself improves! It also lowers inflammation in the gut, which lowers inflammation in the entire body. This is why during a fast–generally speaking I have no symptoms of arthritis; my hands and wrists feel close to normal. Fasting protects the body from future illness by cleansing my system of pathogens and cancerous or abnormal cells. How do I know this is happening? There's a tiny "clear" mole (Google clear moles) on my face most of the time, when I fast–it goes away. This indicates to me that abnormal cells are in decline during a fasting period. The body literally chews them up and spits them out! Abnormal cells can become cancerous, so for me, fasting is a preventative measure. Fasting heals my liver, cleanses the kidneys and all other organs. The liver (which is very regenerative) and kidneys do A LOT for us, occasionally a little break would be nice. A fast redirects energy that the body would normal use to digest food–and moves that energy, that-focus, to cleansing the organs. My body is literally cleaning house! This cleansing goes hand in hand with the recent dysmenorrhea that I've been experiencing (unusual for me), with painful periods, illness during day 1-3 of my cycle and a very long cycle too (46 days on average). Which has been difficult to endure three months in a row. I had to do something! Lastly, I fasted for my mental health. I'm not sure about you but it was a rough winter for me mentally. I had a bit of a cloud over me for several months and I can honestly, wholeheartedly say that this cloud has lifted. I have renewed perspective, and I feel really mentally bright and content. My juicing ebook will be available in a matter of weeks. It contains all this info and more if fasting seems interesting to you. Stay tuned friends!